Another Wado-ryu Grand Master has passed away. Hideho Takagi Sensei, Chairman of the Japan Karatedo Federation Wado-kai Technical Committee, died after having struggled for a long time against a bad disease. He had just turned seventy-six. Hideho Takagi, along with Toru Arakawa (who died in 2015), has been the maximum technical reference instructor for JKF Wadokai, in Japan and in the whole world, in the last thirty years. Always showing himself smiling and available, ready for jokes and irony, he knew how to be very severe at the same time, starting with himself. Little is known about him in the West, because he never wanted to give interviews. “I have nothing interesting to say”, he justified himself with the specialized magazines that regularly tried to convince him. The karatekas who have had the privilege of following his lessons swear that he was the fastest and most accurate wadoka they have ever seen, relentless in kumite and superb in kata. In his youth he participated in one only international competition, winning it. The reason why he has not competed more is that Hironori Ohtsuka, the founder of Wado, was never in the jury. Except that once: the one in which he participated and won. Master Takagi was born in Manchuria, in China, at the time of the Japanese occupation, on 23 July 1942. In 1953 he returned to his motherland, with his family, settling in Tokyo, where he began studying medicine in 1966 (specializing then as a dentist) at Nihon University. Right there he met Hironori Ohtsuka, who held a karate class at the university gymnasium, and began to practice Wado-ryu under his guidance. Bob Nash says that Takagi was the first one to whom Ohtsuka said to perform the Seishan step without first unlocking (opening) his front foot, because he had understood that his talented student had introjected the essence of the movement and could thus get rid of that intermediate passage. Hideho Takagi, 8th dan JKF Wado-kai, remained close to Ohtsuka until the end, even if, a few months before the founder’s death, when the Wado world split in two, he chose to remain in the JKF Wado-kai, of which he later became the highest technical guide. “I feel that my main task and duty is to keep the Wadoryu alive, by making sure that the techniques taught to us by Hironori Ohtuska are correctly and effectively performed”, he told his collaborators. And those who have known him and who have trained with him can testify, once again, how well he succeeded. WADO WAZA KARATE Is the Japanese Traditional Karate’s Dojo of the Roman Castles. 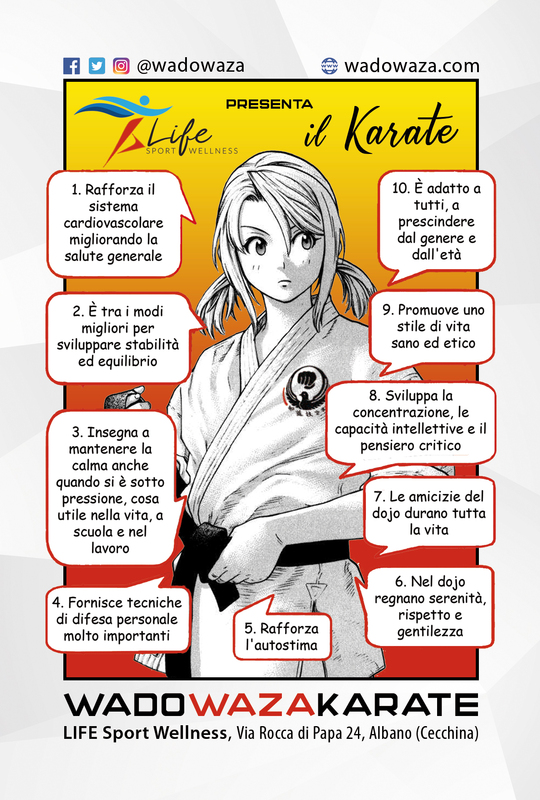 We adhere to WKSI – Wadokai Karatedo Shingitai Italia and we are members of the Japan Karatedo Federation WADOKAI.